A major event in Fukuoka history has been sadly, slowly and extremely quietly unfolding on the western fringes of the city. It is a sad little story that doesn't seem to have entered the English speaking part of the internet yet, so I thought I'd let this blog post fill in the gap. My homage to the short and tragic life of Sky Dream Fukuoka. 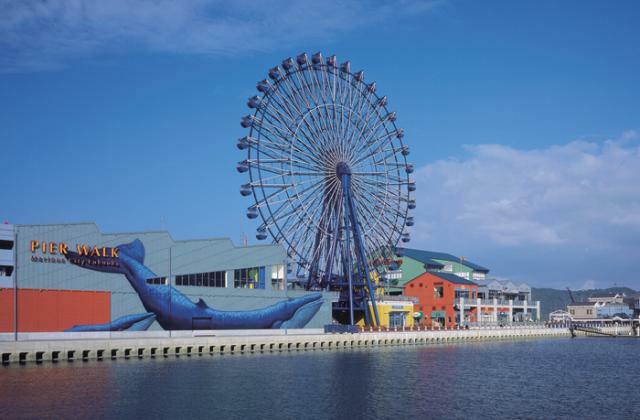 Sky Dream Fukuoka opened in 2001 to much fanfare. Well, at least I assume there was a lot of fanfare, I wasn't actually there. At 120 metres it was the largest Ferris wheel in all of Japan. That is saying something, as Japan is a country dotted with mammoth Ferris wheels, many of which at one point or another in their history could claim to be the largest in the world. 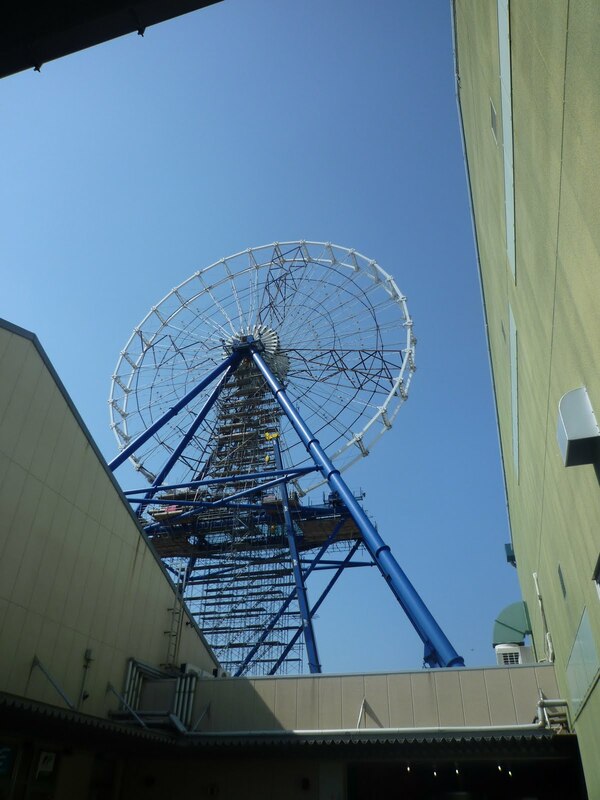 It was built in an odd location, at the then recently opened Marinoa City Fukuoka, a shopping mall in the western suburbs of Fukuoka. I say "odd" because this location put it right next to the SkyWheel Ferris wheel, which at 58.3 metres was a fairly sizable one in its own right. They could be seen from miles away and, lit up at night, dominated the city's western skyline. 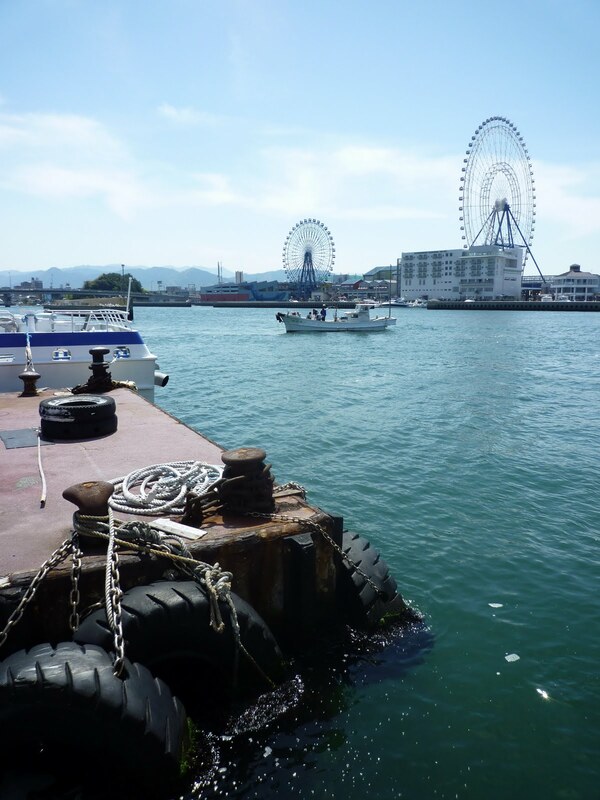 As the Japanese Wikipedia entry notes, this unusual sight became one of the city's more prominent landmarks and they became known as Fukuoka's "twin Ferris wheels." 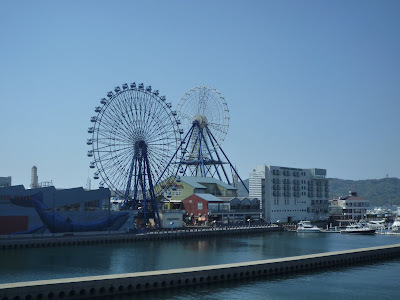 It goes without saying, of course, that while it makes for an interesting sight, putting two massive Ferris wheels right next to each other like this is perhaps not an economically sound idea. Nor is placing it way out in the suburbs at a mall with no rail access. Despite this, passenger numbers were enough for it to be operated in the black. The end, however, came swiftly two years ago. The story in the news as I remember it is that the wheel needed some to have some very expensive maintenance work performed in order to keep it in operation. Its owners, the Evergreen Group, decided that the cost of these and a projected decline in passenger numbers would make the wheel economically un-viable and decided to permanently close it instead. On September 26, 2009 Sky Dream Fukuoka carried its last passengers, less than 8 years after it had carried its first. One of the things I regret in life is that I passed up the chance to take a ride on this wheel. Ena and I made our first visit to Marinoa in August of 2009. We wanted to take a ride on the thing just to say we had ridden the biggest (we've been on other big wheels in Yokohama and Kobe before), but were a bit pressed for time that day (it was actually our anniversary) and decided that we would just do it the next time we visited. We had no idea that a month later the thing would be permanently shuttered. 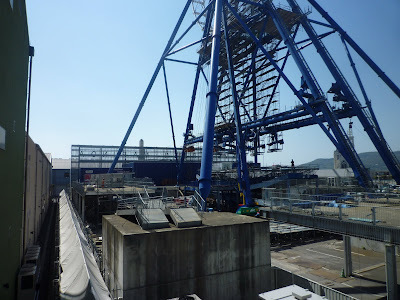 The thing sat silently for at least a year after its closure, but last summer work commenced on dismantling it and by now it looks close to half finished. 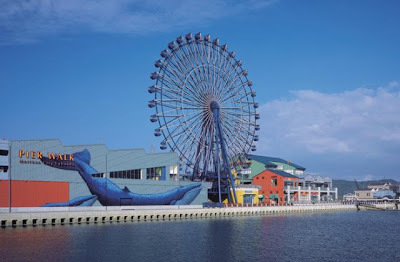 It has been sold to a Taiwanese investor and, once they have re-constructed it there, that country will have a Ferris wheel larger than any in all of Japan (and the 9th largest in the world). Its kind of a sad story. This thing was only 8 years old when it closed - that is barely more than half the life expectancy of a chihuahua. Its entire existence from birth to death fit neatly within the confines of the fledgling 21st century, which must be a first for a structure of this magnitude. Workers were busy at work taking the thing down piece by piece as we visited. It is a massive operation, it looks just as difficult as it must have been to build it in the first place. We had to wonder if this one's days aren't numbered also. In the 15 minutes we were there not a single customer appeared. One by one the lonely little gondolas arced skyward, empty. It was a Monday though and the mall wasn't too busy, perhaps on the weekend it'll get more business. We thought of going up, but it seemed like it would have been a sorry substitute for the big one we sorely wished we had ridden when we had the chance. 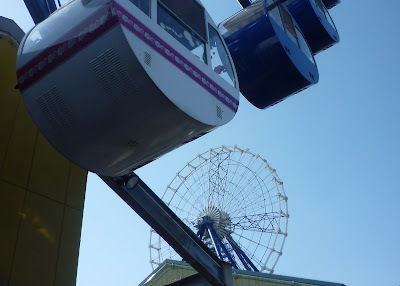 And the 500 yen price for what looked like a 3 minute or so ride seemed a bit steep. Like Trotsky, it was never there. Just a figment of our imaginations. 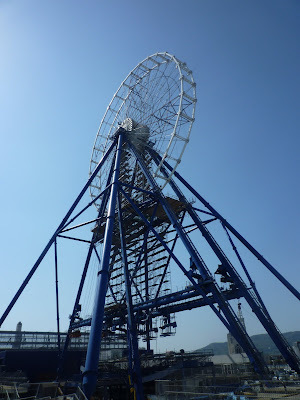 Yesterday I turned on the 9 o'clock NHK national news and their lead story was about this very Ferris wheel. The remainder of it collapsed suddenly while the disassembly work was underway. 2 cranes went down with it, and together they flattened a number of cars and did some damage to the building. Pictures of the damage and story (in Japanese) are available here. That *is* a sad story, Sean. Like you said, though, it probably wasn't the smartest idea to build this one so close to the existing one. Japan's seeming fascination with ferris wheels is interesting to me. Does each major city in the country have one? I wonder what prompted such a trend? Actually, yes, most major cities here do have at least one large ferris wheel in them. The ones in Yokohama and Odaiba (Tokyo) were the largest in the world when they were built. I think most of them were just attempts to put the respective city "on the map" so to speak. Japanese city and prefectural governments often support projects like this (massive theme parks and landmark towers are other favorite variants) to attract tourists. The unsuccesful theme parks just sit and rot, but the ferris wheels get disassembled when economic reality sets in. Do they tend to attract Japanese tourists, Sean, or tourists from other countries? It's a very interesting trend/phenomenon regardless. 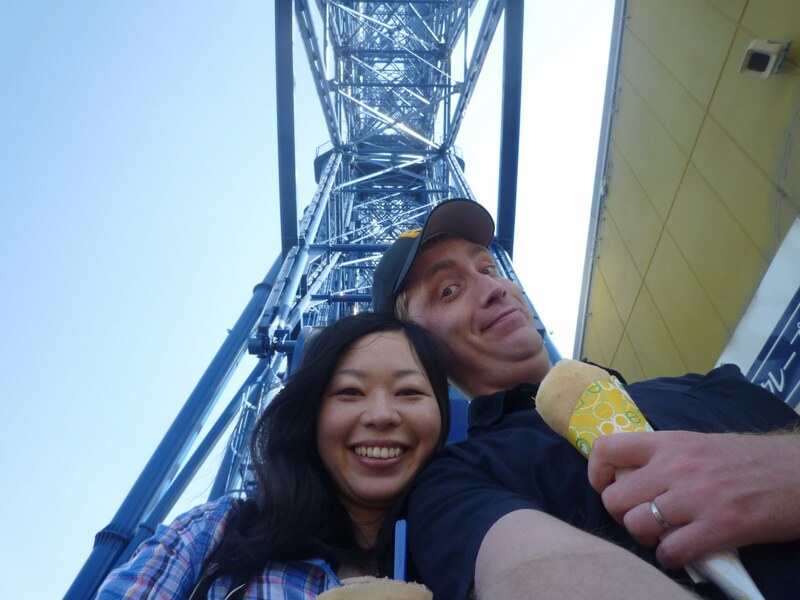 Are there lots of theme parks in Japan, too? Actually when these (and most theme parks) were built (mostly in the 80s and 90s) they were intended for mainly Japanese tourists. In recent years though a lot of them have switched to targeting Chinese and Korean visitors, who have a lot more money than they did 20 or 30 years ago. He is a really good writer and visits "odd" places like theme parks that have gone bust. Very very entertaining reading.